To add Custom Fields and Waivers to a Volunteer Position with shifts disabled go to Campaigns > Edit This Campaign. Here you'll find the Tool Settings tab where you can select Add or Edit for the Volunteer tool. Next, click Add Volunteer Position (or click into a Volunteer Position you have already published) and scroll down to the Volunteer Shifts. 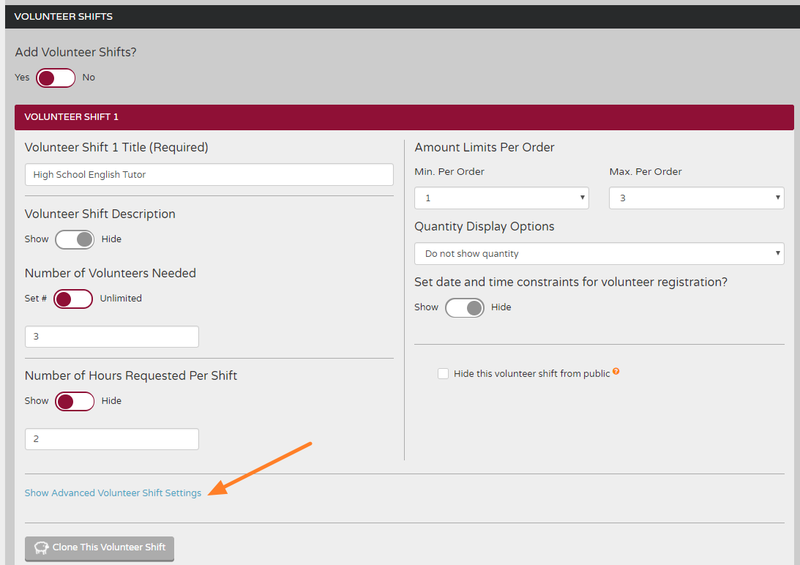 Click the toggle to No to Add Volunteer Shift. Click on Custom Fields and Waivers. 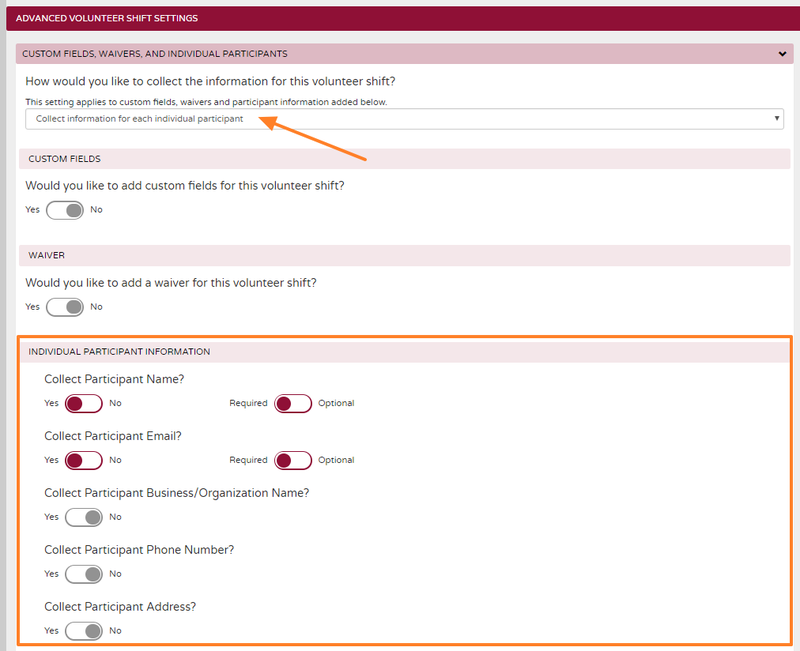 By toggling to "Yes," you can select from the dropdown menus and add custom fields to the volunteer position. You can also select "Create a New Custom Field" or "Create a New Waiver" from the dropdown menu and create one on the spot. It's possible to add multiple custom fields, but only one waiver. 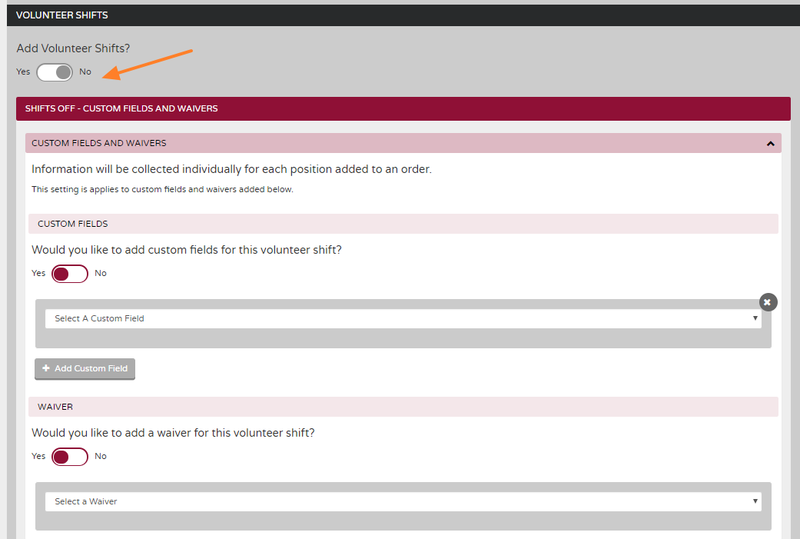 To add Custom Fields and Waivers with Shift ON you will need to go to Advanced Settings in the Volunteer tool. To edit Advanced Settings, go to Campaigns > Edit This Campaign. Here you'll find the Tool Settings tab where you can select Add or Edit for the Volunteer tool. Next, click Add Volunteer Position (or click into a Volunteer Position you have already published) and scroll down to the Volunteer Shifts. Click Yes to Add Volunteer Shift, then click on the blue text for Show Advanced Volunteer Shift Settings. Below, you’ll find details about each of the Advanced Settings you can set up for your Volunteer Shift. You can collect specific information from supporters based on the actions they take within your campaign by adding Custom Fields and/or Waiver. By toggling to "Yes," you can select from the dropdown menus and add custom fields to an individual item type. You can also select "Create a New Custom Field" or "Create a New Waiver" from the dropdown menu and create one on the spot. 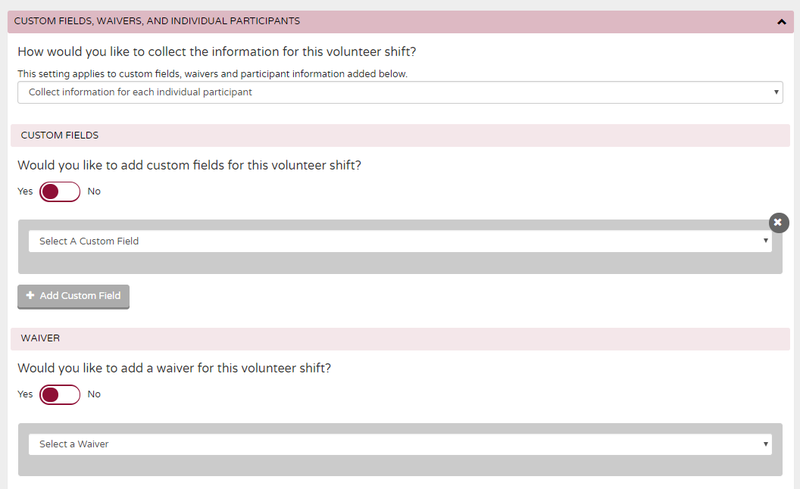 It's possible to add multiple custom fields to each volunteer shift, but only one waiver. With the shopping cart activated, these fields will display at the end of the checkout process (after your supporter has entered their personal information and before the transaction is submitted). Adding Custom Fields and Waivers within Advanced Settings ensures that they only display when a supporter selects that particular volunteer shift. You can also add Custom Fields and Waivers to an entire order (regardless of what item the supporter purchases) under the Order Settings tab. In order to add custom fields and waivers to a volunteer shift, you'll have to choose how you want to collect the information. Select this second option if you want to collect responses to custom field questions only once for a particular registration group type (and not for each individual quantity of that item). In addition to Custom Fields and Waivers, you can also choose to collect Individual Participant Information from within Advanced Settings. From the information collection dropdown menu, selecting Collect information for each individual participant will bring up the toggles for collecting Individual Participant Information. Activating any of these information collection options within Advanced Settings allows you to collect information from multiple participants for multiple registrations within a single transaction. For example, if you have multiple people signing up to volunteer within a single transaction and you want to collect each person's information, you'll want to use these Advanced Settings to collect participant information for each participant.